I saw a book recently I’d like to buy, possibly. But there’s a problem. I just bought two books, haven’t had time to read them yet, and I’ve maxed out my book budget for the month. Drat. Oh, well, I have more books in my to be read list than I can possibly read in the scant free time I have… driving on. Then I sat back and thought it through. As a reader, this was a ‘oh, that looks neat, can’t do it, no worries,’ kind of moment. If I were that author, though. If I were that author, I’d just have lost a sale and I’d have no idea why. Now, here’s the thing: it’s absolutely not the author’s fault. There’s nothing wrong with the cover. It fits the genre and attracted me as it is signaling genre I enjoy reading. The blurb is intriguing without being too revealing. The lead-up post that got me to link through to the book was funny if wordy, but suitable to audience. What went wrong with this potential sale was all on my end. The timing was off. So how do you correct this if you are an author and you want to sell books? (I can’t help you if you don’t want to sell books, sorry. You’re looking for validation in ways that are inscrutable to me.) But to sell books, people have to know you have books to sell. Since we’re no longer in the age where you’d haul your boxes of books to a market, and stand there beckoning shoppers closer to see your wares… then you’ll have to understand the marketplace as it exists today. Readers are flooded with options. Many of those options are very appealing to them at first glance, and they may stop, look at your book’s cover, and if you’re lucky, read your blurb. However, unlike the markets of old, the internet marketplace is a dazzling, dizzying sparkling market packed full of things to do, pictures to see, movies to watch… but just like the old markets, the coins in the shopper’s pockets don’t multiply by magic and when they are gone, they’re gone. The trick, then is to put your books in front of the shoppers in an appealing way, at the right time. How do you know what the right time is? You don’t. The second best thing to a buy-right-now is a buy-later. Wishlists are a way that I keep a list of books-I-might-buy but they are mostly reference types, more expensive. Fiction I impulse buy, most of the time. So ideally in a few weeks, I’ll see this book float by in the infinite marketplace again, and I’ll have the coin, and I’ll scoop it up and drop it onto my pile. Ideally. If I don’t see it again? I’ll likely forget it exists. It’s not by an author I read often. I have no real impetus to go looking for it with that coin in my pocket. Like many other readers, I have a terrible memory for the books that caught my eye and I didn’t impulsively purchase. Even authors I know and like – even authors I have as friends on social media! – I miss new releases from. The key to getting the later sale, then, is to remind the shopper your book is still available, and to do so in a way that doesn’t come across as pushy, or begging. If you have to plead for your audience to buy your wares, it doesn’t say anything good about them. Right. Now that you know what needs to be done, how do you do it? There are a lot of ways, and this is a good place to talk about marketing techniques in general. Self-promotion can feel icky. Or, for others, it’s as natural as breathing but it’s off-putting to everyone around you. Here’s the key: don’t make it all about you. That’s all there is to successful sales and marketing. The world doesn’t revolve around you, or your product, it revolves around the purchaser. They have a need. You have a product. If your product doesn’t meet their need, they aren’t going to buy it. This is an easy equation to understand if, for instance, you have a refrigerator and they need a stove. D’uh? But it starts to get stickier when they need entertainment (and it’s totally a need, not just a want. But that’s outside the scope of this post). Some people only enjoy watching movies, or TV, or crocheting to relax. Others enjoy books, or perhaps audiobooks. And then we break down into genres. Yes, I know genre was created to shelve books. It’s an artificial constraint that limits creativity. Yes, yes. However, it’s a powerful marketing tool. I used the comparison above of a stove and a refrigerator. There are immediately clear differences in the two. Similarly, a book is different from another book. Sure, they all have a title, an author name, and a lot of words. But that doesn’t mean they are the same, or appeal to the same readers. They can be wildly different, and readers know how to find what they like. They look at genre, because they understand even if unconsciously that they liked book A, so they want some more like that, but is book B going to appeal to them? Back to the nitty-gritty of marketing. You have to decide who your market is. You have a book, let’s say it’s a fantasy. But that’s still too broad. Fantasy readers who loved Tolkein might not also enjoy, say, Dresden Files. They might – I’ll come back to that in a minute- but ideally you want your core audience to see your book first and most. Other audiences who might nibble at the bait before buying your book need less of your marketing money and precious time. So you determine your core audience, and then you need to get their attention. Remember, you’re a small booth in a very large marketplace. How can you catch the eyes of the shopper, and more, how can you remind them later when they have the coin to spare that you’re still there, too? My preference, which I’ve talked about before, is content marketing. I use my blog (and this one, to a far lesser extent. MGC is not a marketing blog, although we do sporadic promotions here.) The idea I have – and it’s by no means original to me – is that by putting interesting material on display, readers are drawn to my little booth, so when I have wares, they are more likely to be generous with their coin. I will have, in short, developed a relationship with them. They trust me to be interesting, amusing, and so they will buy from me. This is also useful for brand building, which is probably deserving of a post all it’s own. Email newsletters: 7.75% click-through rate. (roughly. I’m being simplistic here for examples) And that’s not a low rate! 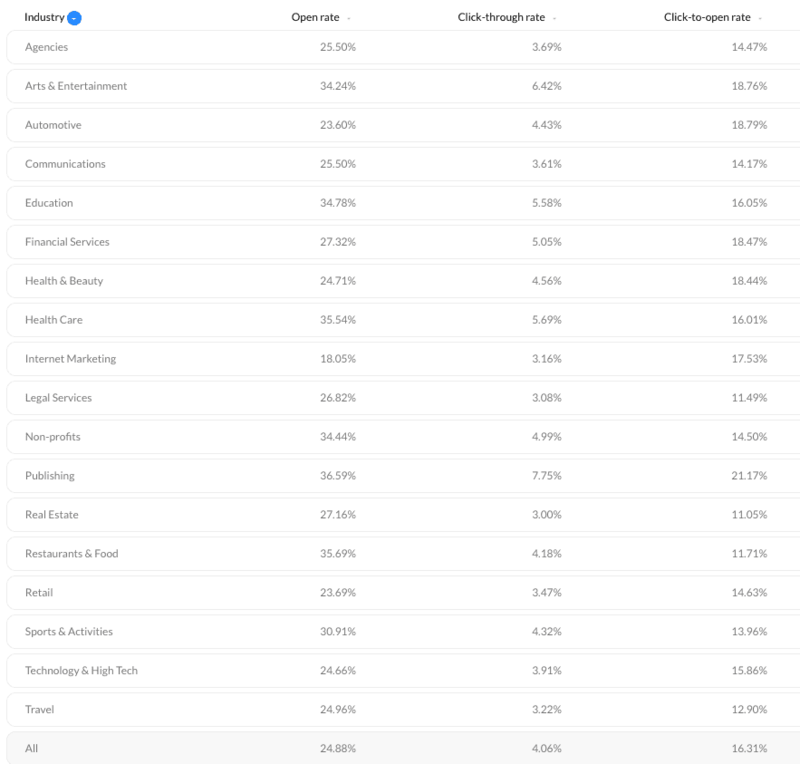 It’s almost the highest percentage per industry. That’s not a buy rate, that’s simply how many people choose to actually open your email and also click on your book link – a huge percentage will delete it unread. So what does this mean? You shouldn’t bother? No, just that without a very large list, you should not expect a high rate of return on this method. Let’s play with the numbers for a second. Say you have a rate like the one above. So for every 10,000 emails you send out, 39% will open it (10,000x 0.39=3900) and then 7.75% will click on the link (x 0.0775), that means 302.5 people will click on the link to your book for sale. That .25 a person we can safely ignore. He’s probably a bot, anyway. So of those 302 interested shoppers, how many will actually buy? Let’s be wildly generous and say that half of of them will. Whew! Great book! Fantastic… but how did you get those 10,000 subscribers? That takes time. And you must do it organically. Sure, you could buy a mailing list. No idea what that costs, it’s not something I would do. Why? Because that’s not my core market. They have no idea who I am, they don’t trust me, and in fact, their response to your unsolicited email is likely to be to head straight for the ‘unsubscribe’ button. You’ve had one chance, and you blew it. How do you get subscribers? Well, one way a lot of writers use is to offer a freebie if interested readers sign up for their newsletter. And how do you create an email newsletter, anyway? Take a look at MailChimp. It’s a really good one, and free. Or you can buy ads. This can be like using a slot in an already-established email newsletter (BookBub, eBookHounds, and suchlike) which can cost from free, to a few dollars, to hundreds of dollars. Your ROI may vary, as the email lists are not always targeted very well. My last use of this, to promote a giveaway of Pixie Noir, led to some confused reviewers who were evidently expecting a more, um, normal fantasy with a romance in it. Which PN isn’t. I’ll be more careful next time I market like that. You could also buy ads on websites. Which might be throwing your money away, because who browses without an adblocker these days? I’ve recently contemplated buying an ad on a podcast, but I need to have books in audio before I test that. I suspect the target market of podcast listeners prefers audio to text. Social media is trickier. Sure, everyone will cheer you on the first time you share a book release. But they don’t want to see it every week. Or even every month. And with the throttling algorithms in place, your subscribers, friends, or mere acquaintances may never even see the posts you worked so hard on. So use this, when free. Do not bother with spending money on it. And make it more about engagement with fans, and branding, than about sales. Better still, use it to attract people to your ‘booth’ where they can find what you have to offer. Keep this in mind. It’s not about you. You are not selling yourself, you’re selling a product. You believe in that product. You must, or you wouldn’t be trying to sell it, you follow me? Your market has a need. What your goal is, is to find that market and fill their need. They aren’t going to find you. Gone are the days of the shopper who would wander through a market – or a bookstore – browsing for a book that caught their fancy. There are still a tiny pool of people who do that, but they are not your market. You have to attract the attention of your shoppers. You have to give them a reason to come over and check you out. And if they don’t have a coin to spare? You have to gently remind them of your existence another day – not too soon! – and oh, you should gain their trust. So they will come back, and bring friends with them. But that’s another post. The closest thing I can think of is being able to grab leftovers from the “free lunch” from somebody else’s meeting, which does happen a bit in corporate and academic settings – but even then somebody paid for it. When you present a link to someone to click you need to keep in mind many of the click tracking services are blocked at the network level, a level that it is difficult for the user to modify. I subscribe to a fair number of mailing lists that suffer from this problem and it makes it difficult to find the book’s page, often requiring you to copy/paste/search for the title in your browser. Take pity on your reader and include a link at the top of the e-mail that goes directly (not through a potentially blocked tracker) to a web page with the same information and non-tracker access to your book’s location. You need to decide what is worth more to you, the click tracking from your e-mail or the reader’s visit to your book’s page. You can still do tracking once the reader shows up there so not all is lost. To the best of my knowledge, Mail Chimp does not use a click tracker. My personal preference is to simply draw folks to my blog, where I also maintain a web market and links to my books. Going through my e-mail trash box, here are a few like I was talking about that are blocked by the network tracker filter. Oof. Yes, I see what you mean. No, that’s not a good idea. And thank you, because this wasn’t something I had seen before. Magnolia ice cream niche? Not out here, it’s available at every Asian supermarket, not just the Filipino ones (and it’s a heck of a lot cheapest). Raw purple yams are readily available too. In Ohio it is. I was being snarky – niche in one place is likely quite common in others, or it would not be sufficiently in demand to be carried as niche. When I flew for Blue Bunny (alas, they did not pay in product nor did we get free samples), the chief pilot said that they had very pronounced regional flavor lines. Black walnut sold in some markets, praline pecan in some, and so on. Other flavors were more universal (chocolate, vanilla, Bunny Tracks™ Original). Yam and cheese. It looks so wrong, it tastes so right. Jungle Jim’s is an excellent place to find niche foods. And not bad for getting a tiny bit of exercise, given the footprint is on a similar scale to that of a college football stadium. Do they have the purple carrots, too? trying to figure out how to translate this top a YT channel.